I’m trying to make the most of my last couple months of poker, so while I’ve reserved my Saturday afternoons for stuff at home since Portland Meadows initiated their noon $10K GTD NLHE tournaments (at least when I haven’t been on a poker trip), I’m trying to cram them in. I got there not long after the start of Round 1, and promptly managed to lose 6K of my 25K starting stack to a very nice Russian lady on my right when she flopped the wheel and I turned a flush draw and made two pair on the river after raising 4♣8♣ under the gun. I managed to chip back up from that and a few other bad choices with K♠5♠, after I turned the nut flush. A low fifth spade on the river made me worry for a minute about a steel wheel, until I realized that my five blocked any straight flush. That was about it for success, though, as far as my stack went, though I did crack the table up with a joke about Neil Diamond tickets. I clung on with a couple of shoves, pulling out a chop with AxJx v AxKx when the board double-paired. I went into the third break with half the starting stack. 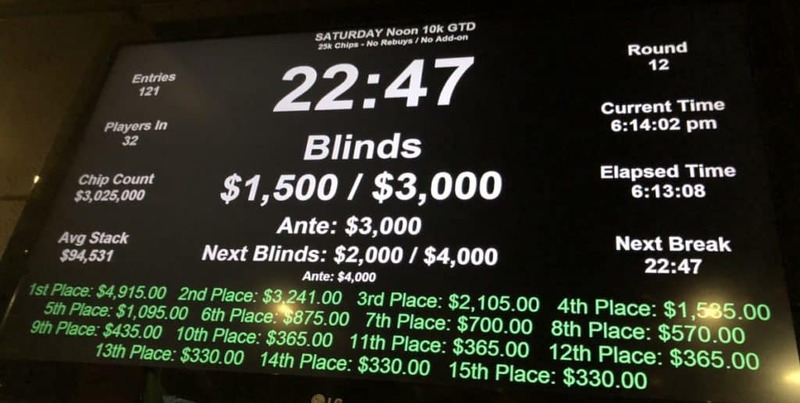 I ran it back up to 32K, but the blinds were eating big chunks out of my stack, there were several big stacks at my new table, and I went card dead, picking up absolutely nothing where I had two cards both above eight. Eventually, on a button raise against my big blind, I shoved 4bb with 6♥5♠, got called by AxTx and busted on the flop. Out 32nd place, 17 from the money.